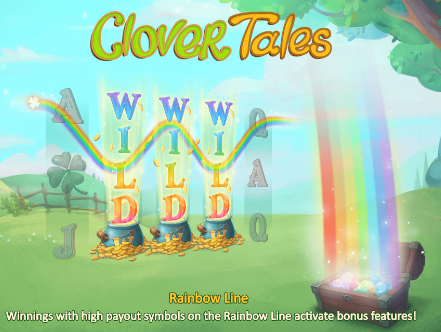 The clover tale is a Irish luck themed game which is available in playson slot and has 9 fixed lines has 5 reels with 3 rows of symbol and 27 pay lines. This game has a very attractive feature of rainbow line where the wilds that land on this rainbow line expand gradually. 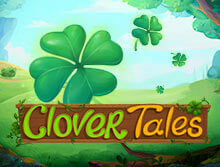 Clover tales is a very interesting slot machine game provided by playson and holds its roots with the theme taken from the culture of Ireland. The scenic beauty of the game is very adorable with a blossoming garden. There is an Irishman having a small nap in a moving chair. There is a bag filled with many magical gems and stones that appear on the right side of the screen. The game gets an amazing touch by the incredible sound effects given to the game. There is a very gentle and soft music that plays in the background of the game and creates a playful environment with sweet chirpings of the birds. There are few important symbols on the rainbow line and if the player gets these symbols then he unlocks an opportunity to get free spins and re spins. The only condition is that the symbols must appear on the “rainbow line”. When a player gets a win by getting a winning symbol then he gets a chance to use 1 or 2 free spins or 1 or 2 re spins and whether he will get a free spin or a re spin it depends which symbol has he got. The gambling lovers who are good in this field will enjoy the beautiful scene of the garden with pleasant background music. There is a gold pot in the game that keeps on expanding wild in the game and this is triggered on the 2nd, 3rd and 4th reel to replace the other symbols present on the screen. If a player spins 5 pots of gold coins then the player can enjoy a very high ranged payout of 2500 coins. There are many symbols present in the game but the two symbols that must not be ignored by the player are the leprechaun and the pixie which can act as a jackpot for the player and can further help the player to gain up to 1500 coins if the player succeeds to find 5 on the reel at once. The next range of winnings is the middle paying symbols which includes the golden horse shoe, the pipe and the 4 leaf clover which can all add up to an reward amount of 500 coins. The least paying symbol is the high card which has the winning value up to 300 coins. There are 9 pay lines available in this game and these 9 pay lines are not alterable that means they are fixed and hence there are maximum number of victory opportunity at every spin. There is an arrow button available on the screen and the player can easily change the bet and place the bet by clicking on it and selecting the required range that varies from 0.27 to highest value of 90.0 per spin. There are up to 100 automatically provided spins in the game. There are two very exciting spinning features available and those are free spins and re spins. It implies that when ever the trigger points on them then the player can activate the special features. When the player reaches the pixie or leprechaun present on the rainbow line then the player wins free spins with 5 provided and 1 to 5 extra wilds on the reels. There is a wandering wild feature that means there are some wilds that keep on moving on the screen which also contributes to get free spins. The re spins will be triggered once the player will land on the pipe clover or horse shoe. This not only gives the player re spins but it also provides frozen wilds that fix themselves on the reel. the player may also get a re spin along with a shifting wild in this case the position of the reels change and gives more ways to gain victory. This is a very exciting game and gathers a large number of people to itself due to its different concepts and features of spins and re spins. The people who are inspired with the Irish games will love this ultimate game due to its pleasant theme and amazing animation effects. The game has proved to be one of the most desired Irish games due to its unique theme based on culture and the colorful symbols available on the screen. The various innovative features add on to the popularity of the game and hence everyone wants to give at least one try to clover tale and have fun.